TORONTO — Minister of Industry, Investment and Commerce, Hon. Karl Samuda, has assured potential investors in Canada that opportunities abound in Jamaica for them to create wealth and, at the same time, assist the Jamaican economy. Speaking at the JAMPRO Invest in Jamaica Toronto Forum, held on June 23 at the Delta Chelsea Hotel, in Toronto, Canada, the Minister said the Government has put in place several measures designed to create economic stability and, which have made doing business with the country easier than it has ever been. Noting that Jamaica has not yet begun to scratch the surface of its trading and investment potential, Mr. Samuda highlighted investment opportunities in several areas, including health and sports tourism, Information and Communications Technology (ICT), Agro industry, Manufacturing, Creative Industries, and Energy. The Minister argued that the agro-industry sector is untapped. "Our land is so fertile. Our flavours are unequalled. We need investors to set up businesses and create jobs," he said. Mr. Samuda said economic recovery can only be achieved in an atmosphere of sound economic policies, the development of a productive and competitive labour force, establishing a business friendly environment with minimal bureaucracy and developing hard and soft infrastructure. The country is moving in the right direction to facilitate investors, noted the Minister. In terms of reducing bureaucracy, Jamaica is now ranked 13th out of 34 countries in the region, including Canada, the United States and Mexico, under the Doing Business Report. Developed infrastructure include Telecommunications, the Caymanas Economic Zone, which will showcase a variety of businesses on 200 acres of land, an Informatics Park, highways, ports, and three international airports. 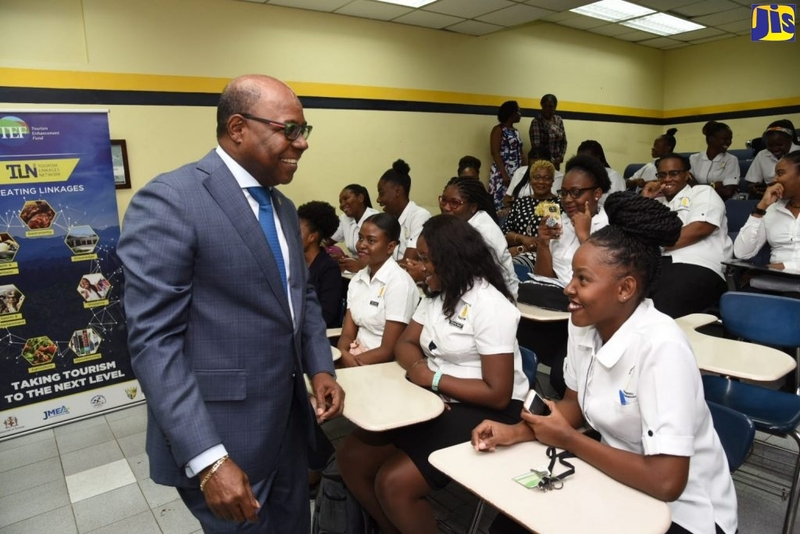 The Minister pointed out that the United States has adopted a "near-shore policy" and Jamaica is ideally situated, with access to North America, Central America, South America and Europe. "Coupled with the infrastructure that we already have, we now need to expand at a rapid rate. We have the land, we have determination, now we need capital to invest and to partner with us," he said. Lauding the work of JAMPRO, Mr. Samuda said the agency has done a phenomenal job. "We've been able to attract a fairly substantial amount of Foreign Direct Investments (FDIs) over the past several years. While we are a small economy, it is not insignificant that we have, over the past five years, been able to attract total FDIs of US$4.8 billion," the Minister added. In her presentation, Jamaica's High Commissioner to Canada, Her Excellency Sheila Sealy Monteith also lauded the work of JAMPRO and the re-opening of its North America office in Toronto, last year. "Over the brief period of its renewed operations, the office has begun to make inroads into strategic areas of interest," said the High Commissioner. Other presentations were made by the President of JAMPRO, Sancia Bennett Templer, and Deputy Director of the Department of Foreign Affairs and International Trade Canada, Sue Rauth. Investors were able to get more information during three roundtable discussions focusing on Major Investment Projects and Privatization, Information and Communications Technology (ICT), and Manufacturing. While in Canada, Mr. Samuda was interviewed by the Business News Network (BNN), the only Canadian all business and financial news channel.